1.3 Moving a piece, that is incorrectly aligned, after soldering. 1.4 Does flux do more than just aid in soldering? Should I use a firescale protectant? 1.5 How do I know if my piece is fully soldered when sweat soldering? 1.6 Silver turning gray in pickle. 1.13 Several common soldering problems: balling up, not flowing, join not tight, etc. 1.18 Can I Make Jewelry from Solder? 1.20 Is A Join Made With a Soldering Iron Strong? 1.21 Will Pickle Damage My Beads? 1.22 How do I solder two ends together to be perfectly flat and aligned? 1.23 How Do I Differentiate Silver From Solder Wire? 1.24 What part of a torch flame is best for soldering sterling silver? Part one: I have an extremely (I can’t emphasize how extremely) frustrating time trying to solder these pieces. I do not have the same problem with any other soldering task. I watched all your soldering videos at least 3 times (!) to make sure that I am cleaning properly… using solder appropriately… etc, and I still have a problem, which I can only put down to the nature of the metal somehow changing after being rolled. Have you ever come across this problem with rolled pieces behaving differently? Occasionally after numerous attempts… it will work… but I have noticed often it won’t be a nice smooth solder… but a bit ‘gritty’ in appearance and not the outcome I really want. Part two: I tried torch cleaning and pickling, but when I did the water sheeting test, the water still balled up. I tried brass brushing too, still, the water balled up. Do you think that putting the pieces in a tumbler would clean away this stubborn layer of Schmutz? Must it be really ingrained for brass brushing not to work? To be more specific about the soldering, the solder either doesn’t flow at all, or doesn’t flow smoothly, but it doesn’t ball up either. I have found that sometimes I think it has flowed, but then I find I can pull the hinge (tube) off with pliers after all and the solder has not flowed properly/entirely. Part three: I got hold of some Bon Ami and cleaned the metal with it, and it has cleaned the metal perfectly. The water is now sheeting off, and I am pretty certain this has solved my soldering problem since I have had no problems soldering the last few pieces! Part one: No, I have never heard of this problem before! How are you cleaning? I would torch clean and pickle. You are pressing in plant material and other metals so, there might be a microscopic layer of schmutz preventing the solder from flowing. The other issue is, is this material thicker than what you are used to working with? Perhaps you aren’t heating it hot enough? You didn’t specify what exactly is happening. Is the solder balling up or not flowing? Are you heating up the metal and the pinback evenly? Are you sweat soldering the pinback? Send me some more details and I’ll see what I can figure out. But first, go ahead and heat clean – if you haven’t already – and try one more time. The metal is still the same – the rolling mill won’t change its molecular composition but, the thickness of the metal and/or dirt could affect your soldering success. Why don’t you try making a paste with barkeepers friend or a Bon Ami and water and scrub the metal? The fact that the water is not sheeting, tells me that it’s dirty and somehow you have a layer of grease or other contaminants on its surface. Without being there and actually seeing what you’re doing, I have no other ideas, sorry. I was wondering if you could recommend a solder and flux to use with the annealed steel wire that I am using. I am banging my head against the walls picking and choosing which solder and flux I need to get the job done. I like to make loops and try to solder the ends closed but i just can’t. I want to use this steel and my soldering just doesn’t work. I don’t know if I am not using the proper solder and flux or what. I am cleaning it, trying a torch, just a soldering gun, which I don’t think is really enough heat but, even the butane torch doesn’t work. I have a propane but I haven’t tried that yet. I am not sure if it is the heat or the wrong kind of solder and/or flux. I just tried it and was successful. I used binding wire (the same as you have, it seems) My-T-Flux, a butane torch and silver solder (hard). Basic soldering principles apply: clean metal, tightly fitting parts (no gaps), flux and even heat. If you are trying to solder stainless steel, then you will have a problem. That needs special equipment and materials but, for basic steel wire, this works. The flux is at Rio Grande, as is the silver solder. Something in your process, obviously, isn’t working. It could be the solder type, not enough even heat, wrong flux or dirty metal – or a combination of things. First check that you are using the right solder with the right heat source. Next check that your metal is clean (the solder should be clean too!). To clean the wire, drag it through sandpaper (wrapping the paper around the wire, as you do so) or use steel wool. Wipe clean. Also, check the fit. Are the wires fitting together with no light showing through? Is the fit tight? Hard silver solder doesn’t jump gaps, it works via the process of capillary action and this process doesn’t work for large gaps. Flux your metal well and your solder well. Apply even, hot heat to both sides. Bringing both pieces up to the same temperature at the same time, otherwise, the solder will run from one side and not stay between the wires. If your solder balls up, something – the wire or the solder – is dirty or you didn’t heat the metal enough. Sand or wire brush after, to remove oxidation. A soldering gun is used with a different type of solder. This is called soft soldering. If you are using hard solder, you need to use the butane or propane . This type of soldering is called hard soldering. Both the butane and the propane gas torches are too hot for soft solder. Soft solder melts at 300 – 842 degrees F. Hard solder melts at temps from 1200 – 1490 degrees F – depending on the type: extra-easy, easy, medium, hard, it. The gas flames from these torches reach anywheres from 3500F to 6500F. Way too hot! See these pages on my website for more information on how to solder: soldering. The 4 Steps for Successful Soldering, About Solder. These should help. I also have a bunch of videos on youtube on soldering. The soldering videos are filed in my “Soldering” playlist. Happy experimenting! Moving a piece, that is incorrectly aligned, after soldering. I made a ring. All went well until I was trying to “fix” a problem with the bezel. All is ok but, the top of the bezel is not smooth. Is there a fix? Second question: I started a pendant and shaped the body. Next I shaped the bezel and began soldering but, the bezel it is not quite where it is supposed to be. Can I move it. Or do I just need to scrap it and start over? In your first question, I am assuming that you mean the upper edge of your bezel is bent or marred in some fashion? If so, it’s an easy fix. Turn the ring so that the bezel faces down. Tape a piece of sandpaper (the roughness of the grit depending on how messed up the edge is) to your bench. Using either 220, 320 or 400 grit sandpaper, sand the edge flat by moving the bezel, over the sandpaper, in a figure eight pattern. If is really damaged, you can start by filing away the worst scratches. It’s easiest to hold the item in a vise or ring clamp so that you can file evenly or you can drag the bezel along a wide file. If the edges are deformed (no longer parallel, maybe rippled) and you can still insert the stone, don’t bother fixing it as the bezel wall will adjusted during the setting process. If you can’t fit the stone in, anneal (if hardened) and, using a burnisher, push the edges of the bezel out. (Burnisher is inside the bezel). The Answer to the second question is regarding moving a previously soldered item: yes, you can move it. There are two methods, that I can think of now. The first involves moving the bezel while the solder is liquid and the other involves removing the bezel and starting over. In the first scenario, pickle and flux the entire piece. Use a firescale/firestain preventative if desired. Hold the piece, level, in cross lock tweezers or by resting on an even soldering block. Heat the piece with occasional flicks towards the bezel – especially if it is a larger bezel. Smaller bezels may need no heat at all. Keep heating the metal, moving the torch closer to the seam but, trying to keep the flame off of the bezel. Always heat the largest, thickest pieces the most. In many situations, the setting/bezel/applique, doesn’t need any heat at all as the heat from the larger area will heat it sufficiently. Watch for the solder to flow and then gently tap or push the bezel in place using a soldering pick or other soldering tool. Be very careful as the metal, in this heated state, can be very fragile and break or crumble. Try to not overheat the metal. The second method involves removing the bezel and resoldering. Hold the piece in the air – with the part that you want to remove – facing downwards. Heat the back of the piece until the solder is liquid. VERY gently tap from behind until the bezel drops off. You can also hold it in a third hand or other contrivance and push it off with a solder pick. Sometimes, the bezel survives – sometimes NOT. Watch that your metal doesn’t get too overheated as the tapping my crack or warp your piece – especially with Argentium silver! Sterling tends to crumble when pressure is applied especially, if it is very red. Worst case scenario: pulling or sawing off the bezel and removing any excess metal stuck to the pendant/ring. You will lose the bezel in this instance and a new bezel can be resoldered. Re-sand, reflux, replace and re-solder. Does flux do more than just aid in soldering? Should I use a firescale protectant? “Since you are the great and powerful guru of silversmithing, maybe you can help me. Flux is used at the points you intend to solder to aid in its adhesion. When soldering, do I need to protect the piece from fire scale with a boric/alcohol bath first? Total immersion or coverage would only be important if you were concerned with fire scale/fire stain because you were creating a mirror finish, at the end. According to the research, that I just completed, if you are working with sterling silver, bronze, brass or gold (besides 24K) you should either: Use a fire scale preventative that contains boric acid. Check to be sure that the preventative can also be used as a flux. See my updated information on oxidation, fire scale and fire stain. Boric acid and borax are not the same. See my section on Firescale/Firestain. If oxidation is present in the metal, and it has been through several soldering/annealing steps, and you want a mirror finish, the heat from the buffing process will probably bring the copper molecules up to the surface in a random pattern. It is explained more in the link above so, please check that out. The reasoning behind total immersion is that the flux or preventative will reduce the amount of interaction between the 02 in the air and the metal, helping to reduce the quantity of oxidation and therefore, perhaps, reducing the chances for firestain/firescale to form on the entire piece. Whereas, painting flux only at the join point only facilitates soldering and offers little to no protection to the rest of the metal. Check the highest temperatures that your flux can survive at – fluxes are not all created equal. Handy Flux is effective at 1,100°–1,600°F (593°–871°C). Grifflux: 1,100°–1,500°F (593°–816°C). My-T-Flux, at Rio Grande, is effective from 1,100°-1,700°F (593°-927°C) – 200°F higher than the Grifflux. Once you exceed the effective temperature range of the flux, it is no longer doing its job. So, reducing heat helps to avoid stain/scale by allowing the flux to remain active. Check your flux’s temperature ranges and try to keep your heat from exceeding them. Cupronil, an anti-firescale and flux has effective ranges of: 1,100°–1,500°F (593°–816°C). My thoughts: if your flux is good until 1,700°F and the anti-firescale is effective only until 1500°F, I’d just coat the entire thing with the flux. Now, saying that, I have not run tests of the two, side-by-side. That will have to wait for now! Boric Acid and denatured alcohol anti-firescale and borax-based fluxes have effective temperatures in similar ranges so, without actually testing each type against one another, I can’t recommend one over the other. So, you can either run tests yourself or just use your flux and watch that you don’t overheat your metal. 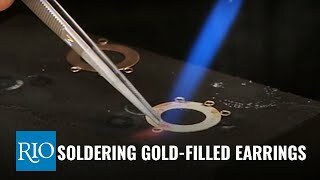 A smaller, hotter flame can help – focused soldering – so that the entire piece doesn’t get overheated. Another option to avoid fire scale/ fire stain is to not have a shiny finish. Think finishes: textures, patterns, surface treatments, patinas, etc. Argentium silver is also firescale/firstain resistant. Actually, some say that it is impossible to create either. But, I’ve also read of people encountering firescale/firestain when using Argentium. Whether they used the metal properly or not, I can’t say. The best thing to do is to experiment AND don’t mix your silvers together as you may accidentally use the wrong material. To determine the type of metal (if your silver’s are mixed up), lightly sand then heat. Sterling will turn black as will the Argentium BUT, if you remove the torch, allowing 02 to interact with the germanium in the Argentium, then you reheat, the Argentium will return to a silver/white color and the sterling will stay dark. If you have fine silver, the color will not change to gray/black at all. Argentium info from Cynthia Eid. See link below. See Cynthia Eid’s post on Ganoksin: Argentium Silver Road Testing. How do I know if my piece is fully soldered when sweat soldering? I like to see the solder on the edges. When sweat soldering, place the solder around the edges – if the piece is small. If it is large, place around the edges AND in the center areas. You should be able to see solder all the way around the sweat soldered piece’s edges. I do some sweat soldering in one of my recent videos: How to make a bezel and set a cabochon, that might help. There are two parts to this video – not sure which part it is on. Don’t forget to heat from the back. Use a tripod or an enameling trivet or other mechanism to hold the metal off the soldering area. Silver turning gray in pickle. From what I’ve found, and I’ve researched this a lot, the gray is actually an etched surface. That is the best explanation I’ve received – after contacting several manufacturers and suppliers. I think it was the Silver Institute who supplied the info (but, am not positive). You can try torching it (annealing temp.) a few times, pickling it in between each heating. If that doesn’t work, abrasives might need to be employed. Try 3M’s bristle discs for areas with patterns or recesses and sandpaper for the rest. The etched layer isn’t too deep (I hope). Good luck and sorry this happened to you! It has happened to me many times – especially when I’ve had to pickle metal clay. Timers help. It’s so easy to get sidetracked in the studio!!!!! You probably need to wash your soldering block. Is it charcoal? With charcoal, I turn it upside down in a bowl of water and let it soak a bit. Then I use a toothbrush or other brush to scrub off any flux and goop that is present. Let it dry out a bit before using and be cautious of steam! If it is a solderite board or a magnesia block, use a rough file or drywall sandpaper and sand down a layer – until it looks clean. Wear a mask! With a ceramic board, (only do this with a cool board because hot ones will crack) immerse in water and do the brush thing. Usually, sticking is caused by flux residue. Here’s a good resource for charcoal blocks: The Charcoal Block, written by Mark Nelson, at Rio Grande’s blog: Rio. Why is my solder balled up and flooding the wrong areas? The rules: metal must be very, very clean. The join is tight. The heat is appropriate for the metal. Flux. Without seeing what is going on it is very hard to determine why your solder is not flowing where you want it to and why it is balling up. It sounds like you are doing everything right. The only things that I can think could be the problem are: you are not heating the smaller piece enough. When the solder flows around where you want it to go, it usually means the section where the solder is flooding is hotter than the other piece. Both pieces must come up to the same temperature at the same time. Don’t forget the most important thing: solder follows the heat. Check the fit on your ring shanks again. The fit must be tight. Also, don’t aim the torch at the solder. You’re not trying to melt the solder with the torch but, you are trying to get the metal hot enough so that ITS temperature can melt the solder. The seam (preferably from beneath the area where the solder is) should be the last place to put the heat – if you need to hit it at all. If both sides of the ring shank are heated evenly, the solder should flow. Are you holding the ring shank in a pair of cross-lock tweezers? They can act as heat sinks. Although, they are great for soldering ring shanks, wire, jump rings, bezels, etc., I often start my torch work by heating up the tweezers to discourage heat flowing towards them. PS – you can stretch that ring with a leather mallet and a ring mandrel. Just hammer it a bunch on the upper edge, flip it over and hammer the other side. If it doesn’t fit, anneal it and repeat the process. There are also ring stretchers that can help. Amazon sells several. Saying that, I own one and have used it 0 times. So…. Sometimes, you don’t get enough heat with those butane torches – especially if the metal being joined is very thick and/or very large. Another thing, when you burn off the alcohol, are you getting a lot of burned looking areas? These areas could be inhibiting the solder flow. IF this is a consistent problem, you might consider a different flux. Balled up solder usually means dirt is present – somewhere. Try cleaning your metal by heating it up with the torch, pickling, keeping your CLEAN hands off the soldering area, brass brushing or sanding it and trying again. The flame is the best cleanser I know of. Balled up solder can also mean that you didn’t get the metal hot enough for it to flow. Experiment with some scrap metal. Try combining different thicknesses and sizes together. Soldering two different types of metal together can also be a problem. Copper, brass and silver all contract and shrink at different rates (with heat) so, one piece might be moving one way and the other piece, another. Also, metals like copper, brass and bronze create a lot of oxidation so you have to get in hot and fast before too much smutz builds up. Are you using the correct flux for your metal? How large is the piece you are soldering to? A jump ring is very small and really doesn’t need much heat. BUT, what you are soldering it to does. Maybe you aren’t heating the main piece up enough. What is a mini torch? Is it butane or is it a Smith Little Torch? Butane is not a hot gas. It can be very difficult to solder large or even medium sized pieces with it. Your torch may not be hot enough. What is the solder doing? Does it melt, ball up, do nothing? Let me know and maybe I can help more. But first, please check out my web pages on soldering – if you haven’t seen them already. Here are the links: 1. Soldering, 2. About Soldering, Oxidation, 3. Flux and Firescale Prevention, 4. The Four Steps for Successful Soldering. Sorry about the prong problems. Here’s what you need to do: First off – it would be best if the pendant was not yet connected to the chain: the greater the mass of silver, the greater the heat sink (the heat is drawn away from where you want it). Solder all the prongs at the same time. How? (#1) Drill holes (in the flat base – basically, whatever you are soldering the prongs onto) the same diameter as the prong. The hole needs to be a tight fit for the wire – a little hard twisting and pushing is a good thing. If it is way too tight either go up a drill bit size, swirl the drill bit in the metal (in a circular motion) or use a round, mini needle file, to open it a bit. CHECK THE FIT OFTEN – every couple of strokes – as it is really easy to over-file (and drill). By using this method the prongs won’t fall out or slide down. This technique also makes the solder join much stronger because more surface area is being soldered. I always use this method when soldering ear wires too. (#2) When creating a prong setting that has prongs all the same height, mark even lengths on each prong – with a scribe or a sharpie. This is to ensure that your prong placement is correct. With uneven material like your pearl, you will probably have some prongs longer than the others. You can skip the scribing step (#2) and do the following: check the fit, make sure that your prongs are annealed, push the prongs into the holes, put the pearl into its location and gently bend the prongs over. Make adjustments as needed – a little more height or a little less. Don’t over work the metal or your wires will break from too much work hardening. If you’ve been futzing with the prongs for a while, go and annealing them – you can keep them in place in the main piece as they shouldn’t fall out. DON’T FORGET TO REMOVE THE PEARL!!!!!! (#3) Push the prongs into the holes – lining up your lines with the top of the hole (if required). If they stick out the back – no problem. After soldering you just clip them, file, sand and polish. (#5) Heat up the metal – not the prongs. Keep the torch away from the prongs. You want the solder to flow from the top of the piece, down the wire (inside the metal). Focus the torch near the first prong, then the second, etc. Remember: solder flows because the entire piece reaches flow temperature AND solder follows heat. Many people have success by heating from beneath. See below. (#6) Are you using a charcoal block as a soldering base? Charcoal is best because it reflects the heat back onto the piece. Sometimes, I place the silver across 2 blocks of charcoal – if the metal is thick (22 gauge and up) and sterling. Do not overheat or do this with fine silver or Argentium. All scenarios (overheating, fine silver, Argentium) will cause the metal to slump. Another option is to use a tripod and heat from the underside. The one drawback is that the tripod screen is a heat sink and will pull away your heat. But, it does work and it keeps you from melting your prongs. Never get the silver cherry red – it will reach failure temperature (when is slumps, crumbles and loses its form) and then melt. Don’t put pearls in the tumbler. Tumble only the metal and then set the pearl. Pearls are too fragile, like opals and other soft stones, for the tumbler. The process of setting the pearl – after tumbling – will work harden the prongs. If they feel a bit too flexible, they can be gripped with a pair of pliers and twisted A LITTLE! Please see the my illustrations below – they correspond with the numbered items above. I do love a good visual! P.S. practice on scrap first! If using copper as a practice piece, realize that the copper will behave differently than the silver. If you mix metals, (i.e. : copper base with silver prongs) you will have other results too as they put off different amounts of oxides AND they melt at very different temperatures.. Practice, practice, practice. The best match for all silvers is hard silver solder because it has the most silver in it. Please see my web page on solder for an explanation of solder types. Hard solder is usually used for the first several solder joins – although, if you’ve practice, you can use it all the way through construction. Because it has more silver in it then say, medium solder, it is also stronger. Do you know, specifically, what metals that you are allergic to? I ask this because (depending on the manufacturer) solder contains zinc or other metals. Your solder paste is fine for any soldering operations – although, I prefer wire. Use as little as possible – saves on cleanup. If you venture into my favorite new metal: Argentium, you will probably want to use Argentium solder. See my page on this: Wire and Sheet Metal for more on Argentium. (Scroll down the page to Argentium Silver – first of the silvers that I discuss). You can cut those bracelets down and make them into rings with no problems. I have several pages on soldering – please read them for more information: Soldering, About Solder, Oxidation, Flux and Firescale Prevention and The Four Steps for Successful Soldering. They should answer all of your questions. BTW, color match is not that big of a deal – if finished properly, (see my videos and visit my web page on finishing.) you shouldn’t be able to see the seams – even on copper, brass or bronze. On treating the bangles before working with them: You will probably need to anneal them before trying to re-bend them. This will take off any patina that has developed so, be prepared to re-patina them, if this is the look you want. Your problem is a common one. My first question is why are you using copper color solder? Does the solder actually stay copper colored? Silver solder works great and if you are stingy with the solder and clean the piece well, the seam will barely, I mean barely, show. Is the solder designed for plumbing? Hope not. It sounds like your metal OR your solder is dirty or you forgot to flux both the metal and the solder or the solder isn’t getting quite hot enough to flow. Sanding is a good first step but, it often gets touched (by your hands) and any grease or dirt will be transferred to the metal. Plus, the sanding leaves a layer of grit on the metal. I would either wash the metal with a good degreasing soap, like Dawn – with hot water and a jewelry dedicated toothbrush or wipe the piece and the solder down with a paper towel and rubbing alcohol. My go-to technique is to warm the metal with a torch and then pickle it – keeping my fingers off of the edges – after the torch/pickle/neutralizing/rinse stages. Clean hands help too and don’t touch your face after washing your hands – the face has tons of oil glands. Another point is that copper is a very big oxidizer. The oxidation starts almost immediately after heat is applied. The oxidation is essentially another form of dirt and that is what we are trying to avoid. Usually, there needs to be sufficient flux and a hot torch that heats the metal up fast. The quicker you can get in and get out, the less oxidation you will have to deal with. If you’ve done all of the above and let the piece get hot enough, and it still doesn’t work then, there is also a very good chance that, your torch may not be hot enough. Butane is not a very hot gas. If you want an inexpensive torch, that will get hot enough to solder (using even hard solder) try this one by Fireworks or a similar one from Zorch. If you intend to keep at this, you might want to look into an acetylene/air, Smith Silversmith version or propane/O2 setup or a Smith Little Torch. You also have to purchase the acetylene tank or propane (I use a B acetylene tank) and O2 Tank, if applicable. Unless you buy a kit like this. You also have to take them to a gas supplier to fill them as, they come empty. This more permanent solution is a much pricier one, I know, but you have a bigger tank and don’t have to keep buying $7 – $12 bottles of gas. The little disposable O2 tanks empty out in a hurry! There’s also the environmental aspect, which is, there isn’t any recycling plan (as of now) for disposal of the tanks. When you run out of propane or acetylene, they just give you a new, full tank and your old one is refilled and given to someone else. Very recyclable. If you go with the less expensive, disposal setup, you will also need to purchase a canister or two of Mapp Gas. Mapp gas is hotter than propane and cleaner. These canisters can be found at most hardware stores. Please see my page Acetylene for more information on this gas and tank setup. Several common soldering problems: balling up, not flowing, join not tight, etc. Is the micro torch butane? Butane is not a very hot gas. Are you trying to solder large, multilayered pieces? That butane torch probably won’t heat up the metal enough. The metal must be pristinely clean and so should the solder! Read my “4 Steps to Successful Soldering“. Also, the solder flows better if there is a little “tooth” to the metal. Ultra shiny metal can cause you some grief. The solution: sand the areas to be soldered with some 800 or 600 grit sandpaper. If you are soldering a plated piece, you need to remove the plating from the area that is to be soldered. Don’t forget to wipe off the sanding residue with rubbing alcohol. Flush edges are a huge deal and I spend a bit of time getting that part right. See my video on doing just that. The (long winded name here) Miter-cutting vise and jig might make you a very happy woman. I love this tool and it is one of my mainstays. They have more affordable versions now (unlike when I first purchased mine). Can’t vouch for these cheaper models but, I love my expensive one. I’m sure they’re great too. The reviews look like they like the 69.00 version best. It matters a lot what type of flux you use. You should use a flux designed for silver soldering – not a plumber’s solder. Here’s the flux I use: My-T-Flux. You can also use a paste like Handi-flux. Please see my question and answers page for links to all soldering related information that I have available. Scroll down the page, the topics are in alphabetical order and you are looking for soldering information. The flux usually is burned off before it reaches soldering temp. The flux is there to protect the metal as long as it can. Metals that have copper in them: copper, brass and bronze, are going to be much dirtier. So, the trick is to get in and out, with the torch, as fast as possible. See my discussion on firescale, flux and oxidation. You can solder the following metals with silver solder: Silver, Argentium (Argentium solders are recommended), Sterling Silver, Gold (although you should use gold solders), Brass, Bronze, Copper, Nickel, Steel, etc. Aluminum, Niobium, Platinum, stainless steel and other metals have very specific soldering requirements and can’t be soldered in the same fashion and with the same type of equipment as for silver soldering (also called “Hard Soldering”). Article on soldering Aluminum. I have never done this so can’t vouch for the process. Here’s an article from Jewelry Making Daily that might also help – on soldering copper and mixed metals. After you check out this information and you are still having problems, let me know. My big tip on this one is: USE LESS SOLDER. (I wasn’t yelling, just emphasizing!) I use the least amount of solder possible. To do that, I roll out my solder wire, with my rolling mill, until it is very thin. Then I cut it lengthwise, down the middle and THEN clip off little pallions. If you don’t have a rolling mill, you can use the sheet solder or the paste but, with the sheet, cut teeny tiny pieces. With the paste, a minute dab. On using silver solder with gold: it is generally recommended to use gold solder with gold. You can use gold solder with brass too, for a better match. But you can’t always match your solder to your metal. I use silver solder with copper, brass and bronze, even though they aren’t color matches. The secret (to almost invisible solder lines) lies in the finishing. The actual solder line is very thin. Yes, it will show – if you are looking for it or looking closely – but, it’s barely visible and if the piece is finished well shouldn’t detract from its appeal. So, here’s where the less is more with regards to solder comes in: since you’ve used only a small bit of solder, there’s less mess to clean up and less finishing required. IF you’ve got a few blobs of unmelted solder, there are tons of different tools, and attachments for tools, that will help you to clean it up – even in the hard to reach places. Check out my page on finishing for more info on that subject. (There’s a link to my video on finishing on that page). The best match for all silvers is hard solders because they have the most silver in them. Hard solder is usually used for the first several solder joins – although, if you’ve practice, you can use it all the way through construction. Because it has more silver in it then say, medium solder, it is also stronger. Do you know, specifically, what metals that you are allergic to? I ask this because (depending on the manufacturer) solder contains zinc or other metals. BTW, color match is not that big of a deal – if finished properly, (see my videos/website for info on that facet of metalsmithing) you shouldn’t be able to see the seams – even on copper, brass or bronze. You could get one of those tiny brushes like this set from (of course) Amazon. I can’t believe it is so hard to get off – must be because of the heat. Maybe use the yellow ochre next time, when soldering very small items. It’s good to know about the white out problem. Thanks. So, I’m assuming the tube is tiny. Can you roll a teeny piece of sandpaper and slide it in and out? Is the tubing big enough to slide a toothpick, with sandpaper rolled over it, into the hole? What about a micro-file? Oh, maybe this product will work: Abrasive Polishing cord. You can string it into your jeweler’s saw and use it like a blade to remove gunk. Don’t know how well this will work with the very tiny cord, though. Mitchell makes the cord in many different sizes and they also make a flat one. Use this for filing the insides edges of pierced pieces. What about these from Poliluster? You can also string sandpaper strips into your saw frame. Fabric backed sandpaper works for this. I haven’t tried paper sandpaper yet or the 3m polishing papers – getting there. “I just discovered your YouTube videos and I hope you can give me some much needed advice. I am new to soldering and have ruined more than a couple of soldering iron tips but I don’t know why. I recently bought a Weller 800 watt iron and immediately ruined the tip. I am including a picture of the tip, and the solder I am using. I don’t solder much with a soldering iron any more. I did when I was doing stained glass though and I do recall some things. Are you using a wet sponge to cool down the tip and clean it? Do you have a temperature control for the iron? It might be getting too hot. Are you “tinning” the tip”? See link below. Are you wiping it clean when you are done? Sometimes the flux can be corrosive. Here’s a link to a soldering iron holder that has a sponge in it. Here’s a link about damaged soldering iron tips, that may be of interest. Also, an article from Instructables on how to tin the tip. Can I Make Jewelry from Solder? While the solder is liquid, impress your pattern. Gail at Can’t Stop Making Things uses rubber stamps. You could press almost anything into the molten solder. Of course, don’t use anything that will melt – unless you want that object embedded in the solder or destroyed. Could be interesting… Watch your fingers – obviously, the solder will be pretty danged hot! There is a paste solder that melts at 278F. Here is a non-lead, silver solder that would work (Amazon). At Can’t Stop Making Things Gail, a contributor, wrote an article entitled: “More Rubber Stamped Jewelry” that discusses her technique for stamping molten solder. Ashley, at Lilblueboo.com has a tutorial on this subject too. Gail doesn’t mention using flux but, Ashley does. I’d vote for using flux. Looks like a pretty simple technique. Good luck and enjoy your experiments! Vicky Patterson has a Pinterest board titled: Jewelry: Molten Solder Stamping to see work created with this technique. How do I prevent my smaller pieces from sticking to my charcoal block. This seems to happen regularly, especially when annealing, and reticulating. It is probably flux that is causing the metal to stick. I would wash my charcoal block, cut down on the amount of flux you use and apply the flux off of the block. To wash the block, submerge in water, flip over and scrub, with an old toothbrush (to allow metal particles to drop out), let dry – at least overnight – and voilà: no more sticking. Is A Join Made With a Soldering Iron Strong? The jump ring join, that is soldered with the soldering iron, will be stronger than if you hadn’t soldered it at all. Soldering in this fashion is like using metal glue or tape: the solder flows around the metal – making the jump ring stronger. Silver soldering (with a torch and high heat) involves the solder flowing into the molecules of the metal creating an even stronger join. Stainless steel is a strong material and not as prone to pulling out of shape as silver or copper-based metals are. The larger the gauge, the stronger the jump ring will be. When I make bracelets from silver, because of the stresses placed on bracelets, I use 16g or 14g metal – if they are not being soldered. You, on the other hand, can get away with a thinner gauge because of the type of metal that you are using – stainless steel. On your questions on jump rings: “Will it break? Will it hold?” I’ve had soldered, 14g jump rings cut in half by a customer. I don’t know how they did it and I’ve never seen it happen again but, this customer managed to destroy a piece of very thick metal, that was soldered closed, that I had to repair for free. I think some people don’t treat their jewelry very well. I always joke that they run it over with their car and then tell us that it was poorly made and that we need to fix it – for free. I take every step, that I know of, to ensure that my work will last forever but, who knows what new ways the customer will come up with to torture our work? So, will the join last? Depends on if it’s run over by a car…hah! Will Pickle Damage My Beads? My question is, why do you even need to pickle your work? You aren’t getting firescale because you are not heating your metal that much, you aren’t getting a glassy, baked on flux from the combination of flux and high heat. Perhaps, all you need, is a tooth brush with some dawn detergent and a little hot water. I wouldn’t put your metal pieces in pickle as there are so many metals – between the tin, copper, silver, steel and others. You don’t want to get accidental copper flashing all over the metallic items. The glass and plastic items are okay in pickle but, not the pearls. Keep organics away from acid. The biggest problems with the pickle will be etching of the metal and possible removal of the plating and the potential for copper flashing/electroplating. But, as I said, I don’t think you even need to use pickle. How do I solder two ends together to be perfectly flat and aligned? This is one of the hardest things to do. It drives me crazy still. That’s why I love the miter cutting vise. Life has been much sweeter since I purchased mine. But, it does have size drawbacks and I’ve been begging and asking manufacturers to make a larger one for a long time. Recently, I heard from a guy who might be able to make me a wider Miter Cutting Vise. I hope he can pull it off, it would be a great tool to have and to share with others. Just checking: you’ve seen my video on straight edges? Next time, when cutting out your blanks, add an extra .5 – 1 mm of metal for adjustments and whoops moments. If you overlap your bezel strip, mark with a sharpie and saw through both pieces of strip/metal; both sides should meet perfectly. You can tape or clamp the overlapping wire/sheet so that it doesn’t move. Don’t file the ends or sand them – except to remove burrs. File at an angle and don’t file the surface to be soldered. Another idea is to make bezels with thicker metal. Much of the strip sold is 26-28 gauge and it is flimsy and easily deformed. Thinner stock is also more difficult to keep level and straight. Besides using the Miter Cutting Vise/Jig and the other techniques discussed in my video, I also use the following trick, performed with a pair of flat, wide-ish pliers. Ta-da – drum roll please! In this scenario, the pliers are used like the miter cutting vise. Push the metal tightly against the interior edge of the pliers to square it up (it helps to have pliers that are pretty square at the interior join). Hold the pliers tightly closed with your non-dominant hand. With a tiny amount of metal sticking out (you might want to mark it – see below)***, and while leaning it on the bench pin, file the end flush – across the top of the pliers. If you can find long, wide pliers, it would increase the size of the metal that you can even-out – I couldn’t find any bigger, than the ones I already have. You need one perfectly square edge, on your metal, for this to work – like with the Miter Cutting Vise. See images attached. I haven’t tried these but, they might work: Wubbers wide, flat nose pliers. I used smooth jawed pliers and the width of the interior surface, of one jaw is 1/4″ wide and 1 1/8″ long to square the edges on my sample. Another option is to level the metal in a vise. Start by ensuring that the metal is level in the vise: ***Using a square, draw a square, straight line on the metal with a Sharpie or with dividers (these are my favorites), Draw the line very close to the end you want to square (see image). You can try to use the square to help level it when in the vise. Although, I do it by eye – trying to ascertain, visually, that it is seated squarely. Line up your Sharpie line with the top edge of the vise. It helps, if your vise is as wide as or wider than your metal. Holding one hand on the file handle and the other, almost cupped around the far end of the file, slide the file across the metal keeping the file square and even. Don’t “roll” the file or angle it. See Nicholson’s file info. (pg. 7) for the correct way to hold the file for this technique. It’s a great resource. Avoid filing too near the edges of your metal because, we humans have a tendency to push harder on the file, near the ends and usually discover that we have rounded the corners. Many times, it is not the “square-ness” of the metal that is the problem but, the angles at which the seams come together. Somehow, what started out as a nice flat piece of metal, becomes a wavy mess – especially with thin stock. I always have totwist, flatten, finesse the metal into alignment. It is one of the most time consuming things I do when making rings or bezels. What helps, is to create a springiness in the metal by pushing each side, over and under, under and over each other until it is springy enough to snap (and stay) together. I also swing the bezel/shank from left to right – over and under and under and over – side to side. Be aware though, that that springiness will suddenly release when you solder and your seam can pop open – especially with thinner stock. Using your hands, line up the edges and then use your pliers to further flatten the seam down. We don’t care if the ring or bezel is round until after it is soldered. The attached images show two views of my squared and adjusted sample. The flat edge was achieved by using the plier method, described above. Another method is, when both edges are very close together – held together by springiness – saw down, through the seam, with a jeweler’s saw. Take care to saw straight down the seam (the as-of-yet unsoldered seam – that is!) This is sometimes done when making tubing and the seam of the tubing isn’t neat. The sawing, theoretically cleans up the seam, creating trued edges. How Do I Differentiate Silver From Solder Wire? This is not going to be fun or fast. I’ll bet that you’ll never do this again after going through this process. I did the same thing and haven’t repeated THIS particular mistake again! Hah! Learning can be such a joy (sarcasm here). Early on in my career, I ripped off those annoying tags, from my Rio Grande solder coils (that stated solder type!). When I went to solder I had a fit – which was which? Silly me. I’ve also found that the tags fall off easily. See below for a way to avoid this exciting adventure. The best way is with a torch. Have a notebook and pen handy and some masking tape. You might also want a timer or a watch that does seconds. Put a tag on the roll or coil of wire, using the masking tape. Sequentially number each coil with a Sharpie or other pen, on the masking tape tag. Then, on a smooth soldering block or charcoal block (not a honey comb as you will be melting metal), add small pieces (1/2 – 1 inch or so) of the wire in the order of your numbering system. Try to separate them as much as possible so that the heat from the torch doesn’t heat up the other wires. Maybe even do one at a time. Heat number one with the torch – try to keep the torch in the same place each time. Start counting evenly, 1, 2, 3..etc. or use a second hand on a watch or timer (better). It’d be easier with another person – what are friends and family for, afterall? Mark down when #1 melted. Wait a second for number 2 to cool down a bit (if affected by heat) now, repeat – and on and on for each wire. The one that melted first is either extra easy or easy solder (don’t know what types you have), second would be medium, then hard and then silver. IF there are close ties, put them side by side and see who goes down first! The difference in melting times will be very subtle so, be as accurate as possible and, if you are unsure, do it again. The difference between hard solder and silver will be pretty close and if you have IT solder, there will be a hair’s breadth of difference between it and silver. The liquidus temps of the three silvers are: Argentium 935, Argentium 960 1700 F, Sterling Silver 1640 F, Fine Silver 1761 F. Although, if you’ve mixed fine, Argentium and sterling silver, just hit them with a torch and the one that doesn’t get oxidation is fine silver or Argentium. To tell the difference between Argentium and Fine is going to be tough as the 30 degree flow difference is crazy making. Maybe, the best way would be to test the two metals right before melting. The Argentium is much more fragile when very hot than the fine silver. Solder is softer. So, you can also try denting the wire and seeing which dents easiest. But, I think that is very subjective and won’t help too much when it comes to differentiating between hard solder and sterling. Next time: Masking tape with type of wire! Or, do what I do and bend the bitter end of the wire into a solder marking shape. You can also devise a bend for your fine, Argentium and sterling wires. Maybe a circle on a pair of round nose pliers for one, a “Z” shape for the other – that kind of thing. No tags to fall off! What part of a torch flame is best for soldering sterling silver? My rule is: use whatever flame type works best for you. I have never followed the flame sizes and shapes recommendations – I rely on experience. If my Acetylene/O2 is hissing, I change the mix of O2 to gas. With the acetylene, I just choose the size of the flame depending on how much heat I want. If annealing, I’ll use the bushier, cooler part of the flame. If soldering, I pull the flame in closer to take advantage of the “sweet (read: hot) spot”. You need a hot and/or a large flame – are you using a hot gas like acetylene or a gas with oxygen? You don’t have to heat the bezel (probably) at all. Please check out this page for more information. At the top of the page are links to additional pages. I use acetylene and air, but I was using a small tip. I have a larger one, so I will try that today. When I etch a design, it comes out beautifully. By the time I have soldered the ring shank and soldered the bezel, the etching is very faint. I have tried Heat Shield it didn’t help. Do you have any ideas? It sounds like the solder is running into your pattern. Mix up some yellow ochre or white-out or make a paste of rouge powder and water, and paint this all over the area where you don’t want the solder to flow. These elements, “dirty-up” the metal and the solder won’t flow there – unless you way overheat it and burn off the product. Don’t flux that area. The next thing to do is to make sure that you don’t apply too much flux – especially liquid flux. You don’t want the flux anywhere near your patterned metal. I apply a small amount of flux, only in the area I’m soldering, heat it up until the white stuff (of the flux) settles down and “glasses up”, then I let it cool. When cool, I paint on the yellow ochre and let that dry. Apply your solder (the minimum amount necessary) and go ahead and solder. This should help a lot! Soldering Questions – You’re looking at it! One of the most asked after subject matter. Many of my web pages have been inspired by soldering issues and questions. Torch/Gas Questions – Portable vs. regular torches, problems with a torch, butane torches, water torches, setting up a torch safely, buying torches.